Welcome summer with a fun printable summer themed word search activity! Click to view and print the summer word search full size! 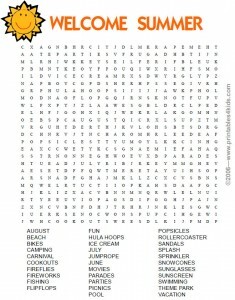 You can also download the Summer Word Search as a PDF file. Don’t miss the rest of our summer printables! good idea to finish school in an entertaining manner!